Amelia Island Plantation, FL will hold benefit this weekend. Amelia Island Plantation, FL will hold its 8th Annual Wine & Art Fest this Memorial Day Weekend with a reduced rate--33 percent lower than the 2008 rate. Friday night begins the celebration with an elegant four-course gourmet dinner. Saturday’s wine tasting, art display and live jazz entertainment will be held on the grounds and porches of The Spa & Shops. Reservations are required. Beneficiary of the event will be Rescuing Animals in Nassau (RAIN). Click here for more information about Amelia Island! River Wilderness, FL's Nine, Wine & Dine events are making Friday afternoons memorable ones. Golfers compete in varied and challenging games. Then the field heads to the Clubhouse for hors d’oeuvres, full entree buffet and manned pasta station. The festivities continue with music and dancing. Click here for more information about River Wilderness! Mountain Air, NC DVD includes bluegrass soundtrack. Mountain Air, NC is offering DVDs of a visual splendor--aerial views of the community’s awe-inspiring alpine setting high atop the Blue Ridge Mountains. Shot during airplane flights, the DVD features stirring and spectacular footage that lets a viewer soar over blankets of mountain mist and vivid expanses of maple before touching down on Mountain Air's private runway. Its bluegrass soundtrack is matched to the long, sweeping views of fairways etched into Blue Ridge topography. Click here for more information about Mountain Air's DVDs! Black Bull, MT is continuing winter activities and festivities for the entertainment of resident members. Cuisine by Chef Erik continues to make clubhouse dining a big draw. Evening events such as Trunk Shows, Wild Game Nights, Poker Nights and Chalkboard Dinner Specials have been well-attended. The Museum of the Rockies holds its annual Fire and Ice Ball on Valentine's Day, and the historic Ellen Theatre in downtown Bozeman, just renovated, will open “The Miracle Worker” this month. Click here for more information about Black Bull! Black Bull, MT will hold its Christmas Stroll this month. Black Bull, MT is encouraging visitors to enjoy the 28th Annual Christmas Stroll, held on Dec. 6. It’s a full day of festive activities held around historic Bozeman. During the day, kids can make gingerbread houses, decorate cookies and listen to music at the Emerson Center for Arts and Culture. A Children's Parade kicks off the Main Street activities, which include music, food vendors, children's outdoor activities, horse drawn haywagon rides, caroling and street performers. Click here for more information about Black Bull! Dataw Island, Oldfield and Spring Island welcome visitors to Beaufort, SC's Christmas events, "A Night on the Town" and the "Light Up the Night" boat parade. Beginning Friday, December 5th, at 6:00 pm, “Night on the Town” includes extended evening shopping hours, special promotions and complimentary refreshments, plus local choirs, dance troupes, puppet shows and bands. The evening culminates with the lighting of the city's official Christmas tree. The next evening, Dec. 6, the “Light Up the Night Boat Parade" will feature more than 25 lighted boats cruising the promenade in Waterfront Park for onlookers to enjoy. Click here for more information about Dataw Island! Click here for more information about Oldfield! Click here for more information about Spring Island! Mariner Sands, FL was a nominee in the 2008 Outstanding Group Supporting Philanthropy Award. This important award is bestowed by the Association of Fundraising Professionals, Treasure Coast Chapter. The Award was scheduled to be given at the National Philanthropy Day activities and luncheon. Since its development, Mariner Sands members have exhibited a passion for community leadership and involvement. Click here for more information about Mariner Sands! Ballenisles, FL is looking forward to a fall 2009 grand opening of the community's new state-of-the-art sports complex. The $26 million project includes spacious fitness center, exercise suites, dedicated Pilates studio, relaxation lounges, casually elegant Bistro Grill with indoor and outdoor dining, adjacent to a 22-court tennis complex featuring an exhibition tennis court with stadium seating. There is also a spa, nail and hair salon, as well as a tropical lagoon-style pool. Click here for more information about Ballenisles! Black Bull, MT website offers virtual tours. Black Bull, MT takes the best of Bozeman and gives members an experience they are not soon to forget. New to the Black Bull website are innovative virtual tours of two club home models and the Corral, the community’s temporary clubhouse. The tour unveils 360-degree mountain views, stunning water features, walking trails, a championship golf course, a clubhouse, a pool and tennis courts. Click here for more information about Black Bull! Reynolds Plantation, GA completes Showhouse. Reynolds Plantation, GA has completed the 2008 Southern Accents Showhouse, located at the 13th tee of the community’s Creek Club. The house, on a wooded lakefront lot on Lake Oconee, opens on Sept. 18 for tours. The Showhouse joins Reynolds’ long roster of “ultimate” show homes. Its living space will open to a full-length covered porch and a separate octagonal screened porch, which face both the lake and the adjacent Creek Club Golf Course. Click here for more information about Reynolds Plantation! Hampton Hall, SC announces the recent appointment of a new clubhouse manager, Mary Claire Gaze, as well as a new membership coordinator, Kendahl Mills. The community has also appointed a new executive chef, John Soulia, who had previously served in that position for nine years at Belfair Country Club, another standout golf community in the Hilton Head region. Click here for more information about Hampton Hall! Black Bull, MT will be part of Bozeman's Sixth-Annual Parade of Homes. Black Bull’s Granite Peak Club Home is property No. 3 on the Parade of Homes Tour, which takes place September 6-7, 10 and 13-14 and is organized by Southwest Montana Building Industry Association. The Parade of Homes offers potential home buyers the opportunity to experience the best in architectural design, interiors and home innovations—and, in this instance, to tour the amenities of a stellar golf property. Click here for more information about Black Bull! The Cliffs Communities, SC announced that it will retain the services of Echelon Sales, a Florida-based consulting company that specializes in the resort and private club real estate industry. Echelon will handle the sales and marketing efforts of the Cliffs Communities in North and South Carolina, including the new Tiger Woods-designed golf course near Asheville, North Carolina. Click here for more information about The Cliffs Communities! The Georgia Club, GA is inviting members and guests to participate in its first-ever Glow Ball Golf Tournament on Friday, Sept. 19. The event’s shotgun start is scheduled for 6:30 pm. In the spirit of the tournament, players are asked to wear their best retro outfits (knickers, 1970s plaid, or the like). The final three to four holes will be played with glow golf balls in the dark. Click here for more information about The Georgia Club! Lakewood Ranch, FL will team up with NFL pro for charity. Lakewood Ranch, FL has teamed up with former NFL All-Pro quarterback and two-time Super Bowl champion Jim McMahon to host a celebrity charitable golf event January 29-30, 2009 at the Sarasota community. The event will benefit the Wounded Warrior Project, the Lynda McMahon Ferguson Memorial Foundation for Literacy, and the Lakewood Ranch Community Fund. Click here for more information about Lakewood Ranch! Seabrook Island, SC just debuted a unique new virtual-tour website featuring a team of Seabrook Island “resident ambassadors.” This high-energy group, known as The Seabrookers, are featured on TheSeabrookers.com, where prospective residents can meet, greet and be “shown”around the community. Different ambassadors provide inside looks at various community features, including the fitness center, racquet club golf course and equestrian center. Click here for more information about Seabrook Island! Learning never goes out of style at Penn National, PA which has formed a new partnership with Penn State University. Residents are invited to sign up for the membership-based courses that will be offered in the fall, winter and spring for $54 per class. The next semester's classes begin Monday Sept. 29 and end Nov. 3 on the Penn State Mont Alto campus and in the Penn National Golf Course community conference room. Click here for more information about Penn National! Black Bull, MT celebrated with its members last month the grand opening of The Corral, Black Bull's restaurant. The Corral’s inventive Chef Erik prepared a savory array of dishes including Black Bull BBQ chicken, baby back ribs, smoked Montana trout, steak skewers with Thai sauce and more. The community’s Tom Weiskopf-designed golf course also opened that weekend, to rousing praise. Click here for more information about Black Bull! Hampton Hall, SC: Tennis players needed for competition. Hampton Hall, SC announced that its tennis program will be participating again this year in area USTA play and that additional players are needed to compete with the Hampton Hall Hawks 3.0 Super Senior team. Competition begins in late August or early September as part of the newly formed Coastal Carolina Tennis Association. Players must be at least 60 years old this calendar year and rated in the 2.5 to 3.0 level. Click here for more information about Hampton Hall! Lakewood Ranch Golf and Country Club, FL recently debuted La Cantera, its newest luxury neighborhood. La Cantera features luxury homes with a minimum 3,000 square feet, on sites of about one-half acre. Each of the 44 homesites offers golf course, water or preserve views. Homes with lots are priced from the mid $900,000s. Click here for more information about Lakewood Ranch Golf and Country Club! Black Bull, MT marked the grand opening of its brand new private golf course on July 25 by celebrating a remarkable hole-in-one achievement. At the par-3 seventh on the Tom Weiskopf Signature layout, Black Bull member Jan Staker aced the 244-yard hole using a No. 2 hybrid. Click here for more information about Black Bull! Reynolds Plantation, GA reports that it is once again the recipient of the coveted Award of Excellence bestowed by Wine Spectator magazine. This is the fifth consecutive year Reynolds Plantation’s acclaimed culinary program has been honored in the publication’s annual Dining Guide issue. Click here for more information about Reynolds Plantation! The Landings on Skidaway Island, GA will host 144 of the finest senior golfers in Georgia for the GSGA Senior Amateur Golf Tournament August 27-29 on its Marshwood course. In tennis news, The Landings will be hosting the USTA National Men's Clay Court Tennis Championships from September 26 to October 2. With 36 courts and a center court stadium to spectate from, all are invited to come out and support the players in this elite national tournament. Click here for more information about The Landings! Black Bull, a premier mountain golf community on 485 acres west of Bozeman, Montana, announces the opening of its new Tom Weiskopf signature course and practice facility this month. The course and practice range add opportunity and challenge to member golfers of all levels with up to seven tees per hole. An unusual 19th hole, or “bye hole,” is designed to settle all bets. The practice facility, covering 16 acres, is the largest in the Rocky Mountains. To coincide with the course opening, Black Bull also introduces its new clubhouse, “The Corral.” The clubhouse currently features dining services for members; tennis courts, and a car washing facility will be available later this summer. 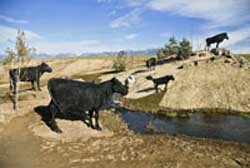 The Black Bull property, located in Gallatin Valley, is surrounded the Rocky Mountains and was once part of the historic Leachman Angus Ranch. Residents enjoy a panoramic frontier feel along with views of lakes, streams, and open space parks in addition to the snow-capped Rockies. Along with the new course and clubhouse, new amenities will include a golf shop and restaurant, a fitness center, swimming pool, fishing dock, and walking trails. Click here for more information on Black Bull! The Club at Olde Stone Club, KY recently invested in a recycling program to not only assist in sustainability efforts, but to help cut the cost of trash disposal. The chefs planted an herb garden that is used in daily food preparation for members’ enjoyment. The garden is located near the fire pit outside the Orangery dining room. In addition, the club’s culinary staff is researching ways of operating in complete compliance with current Green Restaurant practices. Click here for more information about The Club at Olde Stone! Mariner Sands, FL recently welcomed its new director of tennis, Mario Cobo. Originally from Ecuador, Cobo is a six-time national tennis champion and a member of the Ecuador National Davis Cup Team. He is a former instructor at the Nick Bolletieri Tennis Academy in Bradenton, Fla. Mario served for three years as a teaching pro at the Indianapolis Racquet Club in Indiana. He holds an MBA from Union University in Jackson, Tenn. Click here for more information about Mariner Sands! Hawthorn Woods, IL reports that its members are now volunteering as marshals and scorers for the prestigious Illinois Open, to be played at Hawthorn Woods on the community’s Arnold Palmer Signature golf course July 28-30. This is the 59th playing of the state’s open championship and it provides the winner with automatic entry into the PGA Championship. Click here for more information about Hawthorn Woods! Black Bull, MT is opening its new, Tom Weiskopf-designed private golf course this month. The practice facility, the largest in the Rocky Mountains, features synthetic grass for early-season swing training. Weiskopf attended the opening for the 16-acre practice facility on Saturday, July 19. This Friday, the par-72, 7,200 yard course will open to members. Click here for more information about Black Bull! Suncadia, WA is about to premier its all-season luxury destination spa. The 9,900-square-foot Glade Spring Spa, hidden amid a sanctuary of pine trees, is outfitted with 14 indoor spa treatment suites offering a variety of facials, body treatments and wet and dry massages. The $8 million sanctuary offers a Vichy room, vital energy rain shower, wet treatment room and a duo retreat suite—with saunas, treatment decks, and outdoor lounges with fire pits. Click here for more information about Suncadia! Brunswick Forest, NC announces the opening of its new, 18,000-square-foot Fitness & Wellness Center. This state-of-the-art amenity includes an indoor pool, outdoor pool with wade-in entry, expansive sun deck and snack bar; six hard surface tennis courts and pro shop; aerobics studio; cardiovascular equipment room; expansive men’s and women’s locker rooms with showers and saunas; meeting rooms; lounge and juice bar. Click here for more information about Brunswick Forest! Bay Creek Resort & Club, VA has provided the shooting location along with promotional support for a new DVD by the world-renowned professional trainer and health educator, Isabella Jones. For release this fall, the health-show DVD is titled “Resort Yoga.” It was shot in different locations of the Chesapeake Bay resort community, including important segments taped on the award-winning Arnold Palmer golf course. Click here for more information about Bay Creek! The Club at River Oaks, CT has appointed Mike Samol to the position of golf course superintendent. Samol comes to the club from Trump National, where he had served as an assistant superintendent and then as head of the department. The club’s Robert McNeil golf course is a 6,837-yard parkland layout on the Housatonic River. Click here for more information about The Club at River Oaks! Black Bull, MT, as part of a series of important new amenity introductions, is opening the grill in its temporary clubhouse to members in early July. In the Black Bull grill, lunch will served, along with a limited-menu dinner several nights each week. Construction of tennis courts and a car-washing facility has also begun, for completion by mid-summer. Click here for more information about Black Bull! Waterfront Properties and Club Communities of south Florida announces that as of June 1 it is offering gift certificates, ranging up to $7,500, to all purchasers of Waterfront Properties real estate for furnishing and interior design services from Robb and Stuckey Interiors and Furnishings. Waterfront Properties participating in the program include Ranch Colony; Jonathan's Landing, PGA National; Mirasol; BallenIsles and Admirals Cove. The Landings on Skidaway Island, GA has expanded its continuing education programs for residents by introducing a diverse series of free seminars and events that range from gardening to home renovation to the ecology of the island. This series augments the Skidaway Community Institute as well as The Landings’ partnership with Armstrong Atlantic State University. The new program will include on-site art exhibits and decorating demonstrations. Click here for more information about The Landings! Reynolds Plantation, GA was the setting for a back-nine charge that gave Scott Hebert of Traverse City, Michigan, a come-from-behind victory in the 41st PGA Professional National Championship. Played over a demanding setup on the Great Waters course at Reynolds, this championship for club pros nationwide paid Hebert first-place money of $75,000. Sonny Skinner of Sylvester, Georgia finished second, one stroke back. Click here for more information about Reynolds Plantation! Dataw Island, SC sent a contingent of member residents to attend rededication ceremonies for a recently discovered burial site containing the remains of at least 39 persons assumed to have been slaves on the island’s cotton and indigo plantations. The site, a small grove of live oak trees overlooking island marsh, was identified as a slave cemetery via ground penetration radar technology tests conducted by the Dataw Historic Foundation. Click here for more information about Dataw Island! Black Bull, MT has acquired and installed new, state-of-the-art equipment for golf club fitting and testing. The installation includes the Callaway OptiFit System and the TrackMan system for capturing ball launch and trajectory data. Using the Callaway OptiFit, Black Bull pros can now match individual club heads to individual shafts to optimize the golf club for the player. The two systems together remove guesswork from fitting and swing tips. Click here for more information about Black Bull! Huntsman Springs, ID reports that it recently took part in the groundbreaking ceremony for a new Teton County Courthouse building, construction of which is funded in part by the Huntsman group. David Huntsman, the community’s managing partner, expressed his gratitude for the work done to date and thanked county officials for allowing his family and the Huntsman Springs partnership to participate in this long-needed municipal project. Click here for more information about Huntsman Springs! The Landings on Skidaway Island, GA recently approved a $25 million, seven-year capital plan to renovate its Deer Creek and Oakridge golf courses (two of its six private courses) and to expand the club’s fitness center. Deer Creek’s original architect, Tom Fazio, is assisting with the renovation which will include rebuilding greens, tees, and bunkers, installing concrete art paths, improving drainage, a new irrigation system, and tree work. Work should be complete by late 2009. Click here for more information about The Landings! Black Bull, MT: New sculptures echo community name. Enjoy mountain views and a Weiskopf championship course. swimming pool, full-service fitness and spa facilities and more. information about Black Bull, click here.